Do you want multiple trading opportunities on a single stock? Rectangle pattern is a valuable tool. This pattern can be easily spotted as stock/index oscillates between a tight trading range forming a horizontal channel. A Rectangle formation is a classic continuation pattern which emerges between an ongoing uptrend/downtrend. This pattern can be easily spotted as stock/index oscillates between a tight trading range forming a horizontal channel. The beauty of this pattern is that a single security can be traded again and again using different techniques, aiding the trader to explore every opportunity. 1) Bullish Rectangle - If the trend preceding the rectangle was bullish, and the price breaks out from the upper end of the trading range then the price resumes its previous bullish trend. 2) Bearish Rectangle - Conversely, if the rectangle occurs during a down trend, and if prices break below the lower end of the range, the pattern is a bearish rectangle. This indicates that the price will resume its previous bearish downtrend. 3) Reversal of the Rectangle – In addition to the aforementioned rectangle patterns, there are instances where the consolidation turns out to be a base building or a peak formation indicating a reversal in price of the stock. How do you trade a Rectangle pattern? Rectangles can be traded in two ways. Trading inside the Range means buying the stock every time it approaches its support line and selling when it approaches its resistance line. In the following example, if you observe the Bharat Electronics Limited (BEL) weekly chart, there are two times you could have traded the stock. Short sell when price fails to surpass the resistance line for the second time at ~140. 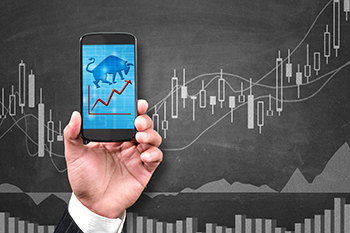 This strategy aids the trader to catch hold of the potential top with utmost precision; in addition the risk reward ratio too turns out to be in favour of the short seller. One could exit short positions the third time stock fails to breach the support line and create long position in BEL. Once again the risk return is in favour as prices are almost near the support zone. b. Trading Outside the Range is when the trader is waiting for either a breakout or breakdown once the trading range is broken. 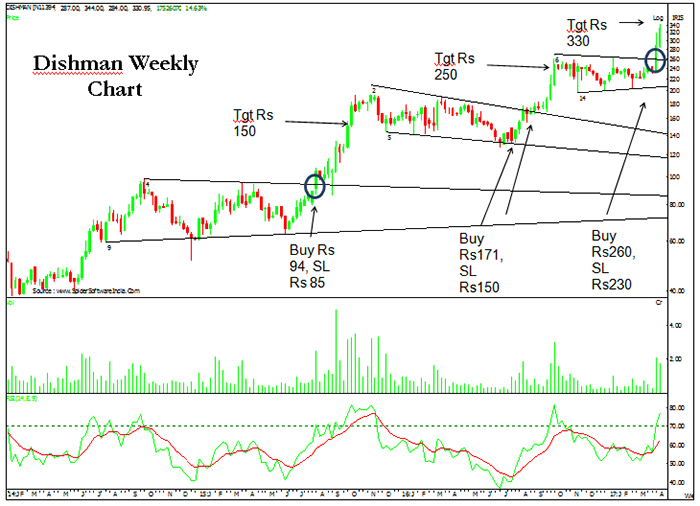 For example: You open a long trade in Dishman Pharma above Rs 95 as Rectangle pattern is formed and breakout is given from the pattern on weekly chart, set the Stop Loss rate at 85 (Previous candle low) and expected target is 150. If you apply the same system, long positions in Dishman Pharma can be created on three different occasions when price breaks above the upper end of the trading range. The rectangle patterns will work as an effective tool to ascertain long and short positions aiding the trader to take calculated trading decisions supported by favorable risk-reward ratio.